Expect to hear more than a dozen new laptops and convertibles from the biggest PC manufacturers in the world in less than two weeks if these rumors prove to be true. 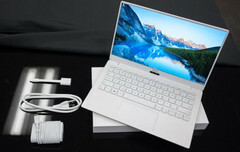 Known for his reliably accurate tech rumors, Ronald Quandt is at it again with a long list of exciting Lenovo and Dell model names that are expected to be officially unveiled next month in Las Vegas. Some of these unconfirmed systems include a Dell XPS 2-in-1 and other unexpected convertibles from both parties. The information should be taken with a grain of salt, but Quandt's sources have traditionally been on the mark especially when the leaks come very late right before their expected reveal dates. 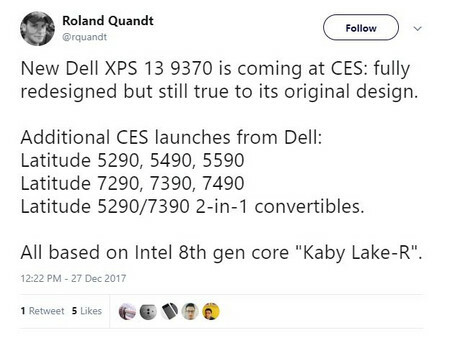 With the exception of the already known Dell XPS 13 2018, there is otherwise very little to no information on these leaked names. According to Quandt, all of the following laptops and convertibles will launch with 8th gen Intel Core ix processors. The source does not specify whether or not these systems will use Kaby Lake-R, Coffee Lake, or both. It's worth nothing that the Latitude 7290, 7390, and 7490 was independly leaked earlier this month via an official Dell product listing. Lastly, an unnamed 11-inch Yoga with Intel Gemini Lake may also be in the works. 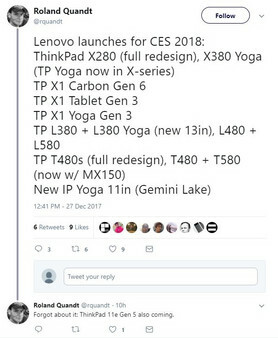 Again, the above information is unconfirmed and in no way represents what Lenovo and Dell are guaranteed to have on display. Even so, nearly everything here is plausible with the ThinkPad T480s and XPS 15 2-in-1 9575 being unique surprises. We will just have to wait until January to see if these models are more than just rumored names.